Wow, so much to see that it was overwhelming. I had to intersperse looking at quilts with visiting vendors and attending demonstrations. Here’s some of what I saw. Political quilts by Thomas Knauer, Chawne Kimber and Colleen Molen. Notice how each one inserts text in a different way. 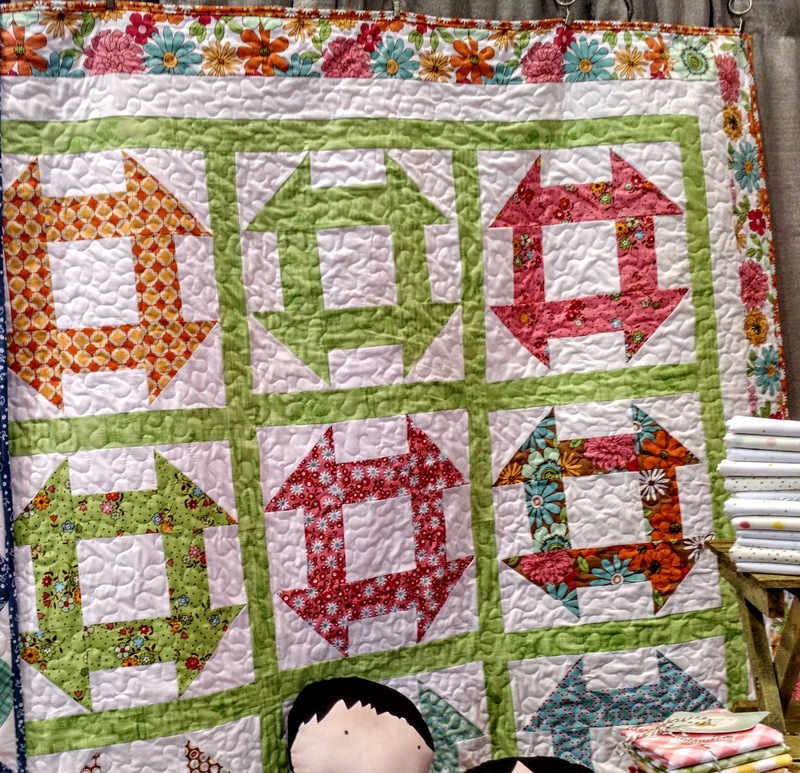 Churn Dash quilts, an old favorite reinvented. The top two are traditional, the bottom four are all taken from the Charity Challenge exhibit. The Modern Traditionalism category: the top one is by Virginia’s own Mary Kerr. 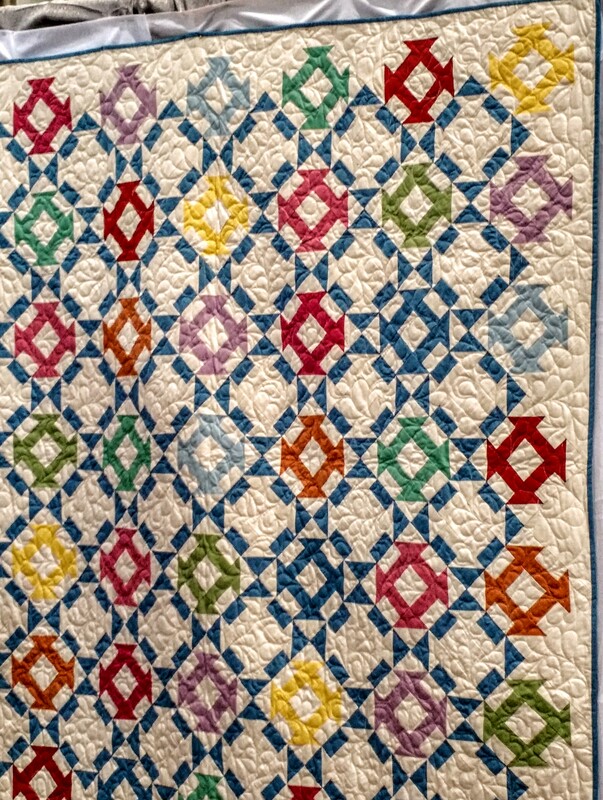 I loved the detail of the old-fashioned print used in just a few triangles in the second quilt. The last one (salmon-colored) was upcycled from thrift store shirts. These next few caught my eye because of playfulness or use of color. The “lobstah” quilt is by Shelley Brooks, one of our founding members before she moved away. Well done! My two favorites were both low volume. This is “I Know the Stars are There Beyond the Clouds 2” by Heidi Parkes. It was huge, beautiful, detailed, and it gor my vote for Best in Show (though it didn’t win). Here’s a closeup of the hand quilting and her use of red thread which is almost invisible until you look closely. 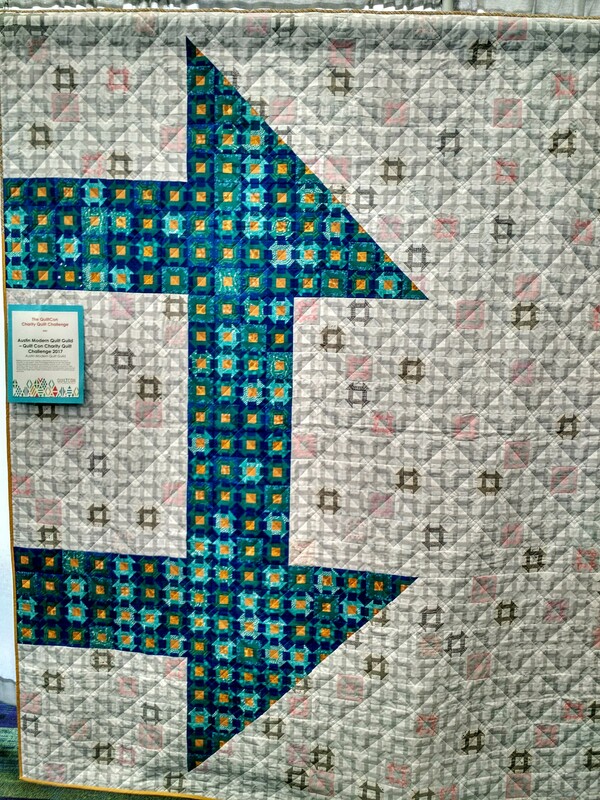 My other favorite is this one, which won first place in the Quilting category: Ode de Yoshiko by Marilyn Farquahar. In between classes, and all day on Saturday, I wandered through the exhibits. So much caught my eye, but I promise you that this is not nearly a majority of the quilts on display. First up, a challenge taken up by a number of modern quilt guilds. “This year’s challenge requires participants to work collaboratively to create completed quilts using a predetermined color palette while crafting a design that plays with scale.” As you can see, the palette leaned heavily towards blues. The playing with scale was particularly fun to see. I’ve always been intrigued with this “Comb” effect, sorry I didn’t record which guild made it. Nice quilting, too. 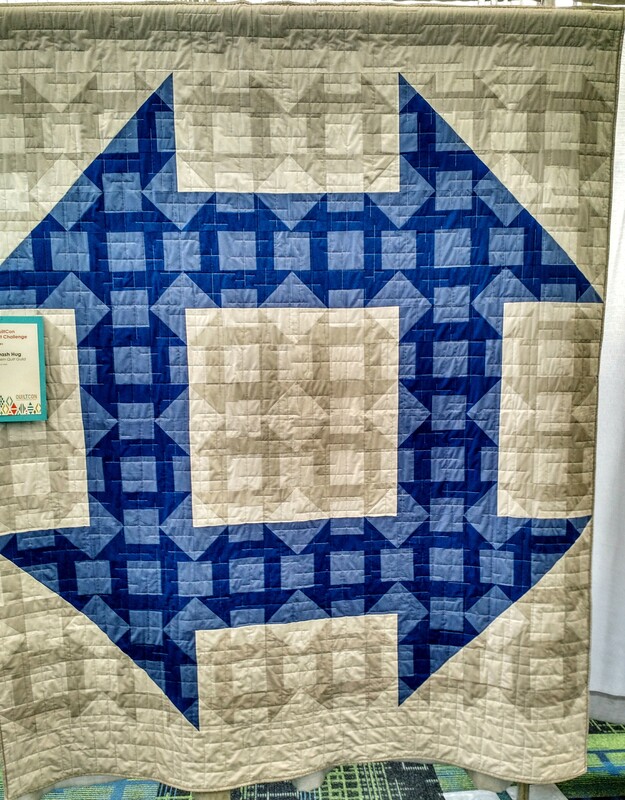 The Lancaster guild played with the classic Amish bars quilts found locally and created this. Again, the quilting is striking. That finny fish at the bottom intrigued me, and I think I can see how she did it. Lots of pleats and carefully placed stitching. Finally, quilt playing with flying geese. This is called Migration. Love the flying geese in the left-hand yellow section. The modern quilt movement has been on the scene now for at least five eight years, and it’s going strong. The annual conference/show, QuiltCon, has been a smashing success, and members are alerted that if they want to register, they need to have their hands poised over the keyboard the moment registration opens. Yes, it’s like getting concert tickets. I was obsessed enough to do just that last June and ended up registered for three classes at QuiltCon to be held in February in Savannah. I was a bit relieved that one class was eventually cancelled, because it gave me a full day to explore the exhibits and vendors. Jennifer and I rented a house in Savannah on the edge of the historic district. Crape Myrtle was perfect for us; two bedrooms, two and a half baths, kitchen, porch, high ceilings, on a quiet side street. 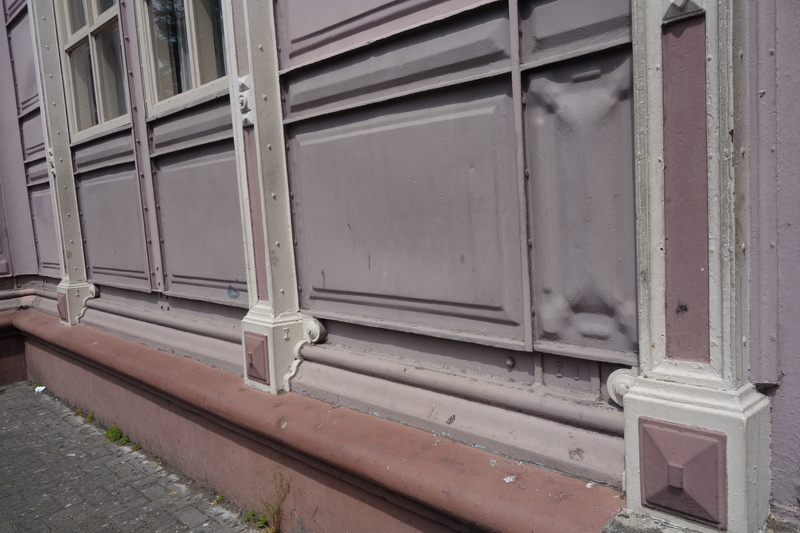 We started off Thursday morning with an architectural walking tour, which I can highly recommend. The tour guide, a young architect, seemed to know everything possible about the history of Savannah as well as the provenance of the buildings we saw. I realized afterwards that “Midnight in the Garden of Good and Evil,” which I was reading on this trip, never did come up, but some of the history he told us helped me to set the scene. Note to self: find out more about James Oglethorpe, colonizer of Georgia and an Enlightenment philanthropist who founded Savannah as a utopian community. Then it was off to the show, which we got to by walking down to the riverfront and taking a ferry across the Savannah River, a trip of about five minutes. You get a nice view of the riverfront from the ferry. My first class was “Sew All the Curves” with Jen Carlton Bailly, aka BettyCrockerAss. She is known for her curvaceous quilts, one of which I spotted in the exhibits. This is her “You and Me” quilt, created with what she calls “chubby squircles.” This was entered in the Piecing category. Here’s a closeup that lets you see how she constructed it with a combination of curved and square blocks. And yes, we learned how to do this! I bought her templates for the larger circles and made an imperfect set, but I think I can do better. The key is glue, people. She was a very engaging instructor and I enjoyed her class and her quilts. Here’s a slideshow of a few she shared with us in class. The next day was a class with Alison Glass, a designer whose fabrics I love. You can see from her shop that she loves saturated colors. You can also see from this photo, taken from her site, that she has a strong sense of design. Just yum. Her class was about translating a photograph into a quilt, and I wish I had taken pictures of her examples. Starting with a fairly simple photo of her daughter standing against a plain gray wall, she made three different versions in fabric, the first fairly realistic and the succeeding ones increasingly abstract. She encouraged us to divide our photos into blocks or strips and work on one at a time. She came around to critique and offered insightful suggestions. I was so absorbed in the class that I didn’t even visit the mini-shop she set up in the back and wish I had picked up some of her gorgeous fabrics on the spot. So here is my original photo, taken in the M’dina in Gozo last fall. She encouraged me to straighten the bottom edge to give a the viewer a better way to see the curving street. She also emphasized working in vertical strips so that I could piece in the windows. Boy, did I struggle with this, but it was totally engaging. The result so far is below, but I have since decided that I want to play with constructing the buildings out of pieced fabric strips to add more interest. As it stands, I find the batik too massive. The hardest part was getting the street to angle correctly, but I think I’ve got it. In process, not finished! More to come. The main purpose of our jaunt to Kansas City was to see the Dutch art exhibit at the Nelson-Atkins Museum. But a quick look at the map showed that the Missouri Star Quilt Company was just an hour away. You can’t pass up the opportunity to see this amazing quilt store complex, can you?? We picked up our car at the gloomy old airport and were surprised to find that they had given us a bright yellow Mustang. Of course, all we wanted to do was to ride around (Sally), so it was good to have an hour-long trip ahead of us. We took an almost deserted highway to a two-lane road that wound up and down rolling hills, some of them rather steep, with rich black soil in the newly plowed farm fields on either side. Another highway, another two-lane road, and we were in Hamilton, Missouri. It’s a typical small town (pop. 1800), with incredibly wide streets (presumably so you could turn a horse and carriage around), head-in parking, and not a whole lot going on. But Jenny Doan and her family have created eleven quilt shops here, and their empire has become the biggest employer in town. We had lunch at the Blue Sage restaurant: a huge side salad of romaine, blue cheese and bacon for me, tomato soup for Alison, and a delicious shared lamb burger with fantastic home-made potato chips. Thus fortified, we started next door at the Florals shop. Brightly lit, nicely laid out, and an enticing beginning to two hours of browsing, yearning and actual shopping. Here’s a peek at what we saw. The Modern shop had fabrics from Cotton + Steel, my fave Marsha Derse, and, as you can see, lots more. Fabrics are arranged by manufacturer or designer. Each shop is beautifully staged, with the Modern shop featuring this mid-century modern tableau. The solids shop had colorful display windows and a rainbow of mostly solids inside. This is where I found the Pepper Cory shot cottons from Studio E that I had not been able to find anywhere! Now I know – everything in the store is also available online. Quilts and inspiration on the wall. Non-quilters are not forgotten. While many quilt shops have a couple of chairs for non-quilting friends (face it, usually husbands), this one features an entire “Man’s Land.” Leather recliners, two big-screen TVs, and bookshelves featuring sports-related books and equipment. Two guys were there, one reading a copy of Guns & Ammo, the other snoring mightily, and both covered in quilts. Alison retired here with a good book. I didn’t break the bank, but I did come away with some project-related fabric, some hard-to-find IBC pins (recommended by Judith Baker Montano), and some random beautiful stuff: blues for my Sarah Fielke BOM, William Morris and neutrals for the hexie quilt, binding for the baby quilt, the shot cottons, and the Potting Shed Daily Deal which I just could not pass up! 46% off!! On the way out, we stopped for a few more photos of the main drag. We tootled back the way we came, stopping only for a picture of this clever Trump sign. Hate the sentiment, love the inventiveness! For the Mid-Atlantic Quilt Festival, about which more later. I stopped in Colonial Williamsburg at the Abby Aldrich Rockefeller Museum to see a small collection of African-American quilts on display there. I caught the very tail end of an informative tour, given every Friday morning, and since the exhibit will be there for some time to come, it would be well worth a return trip. There were several Gee’s Bend quilts, some gorgeous scrap quilts, and two applique quilts that I adored. The lighting was horrible for pictures, but you get the drift. Below is a log cabin done in beautiful silks and cottons. An alphabet applique quilt. The initials and date at the bottom right helped to attribute it to quilter Doris Smith. Above and below is an applique quilt featuring tree blocks surrounded by animals, people, airplanes and other idiosyncratic elements. Below are Davy Crockett, a beaver, and an airplane. This one features angels, birds, flowers, people and everything from shade pulls to embroidery, yarn, and assorted scraps to decorate her top. The two girls pictured here are thought to be dead in part because they are white. I would love to know what this quilter would have said about her creation. From here I moved into another gallery that features just a few masterpiece quilts from the Winchester, VA, quilter whose work is also included in the DAR museum. 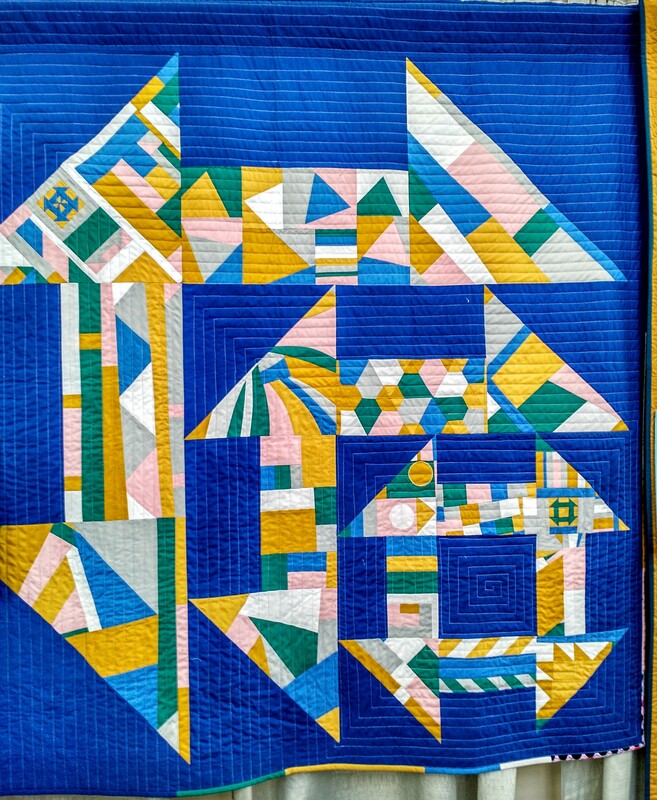 A totally different look at applique, piecing and quilting from Amelia Lauck. Then the icing on the cake: an incredible embroidered counterpane showing a battle scene. Tradition says it’s from the Civil War, but historians date is as being much earlier. Just look at the uniforms! And the gorgeous embroidered trees! What better way to start retirement than by traveling, learning and visiting family? Hence this trip to Costa Rica. 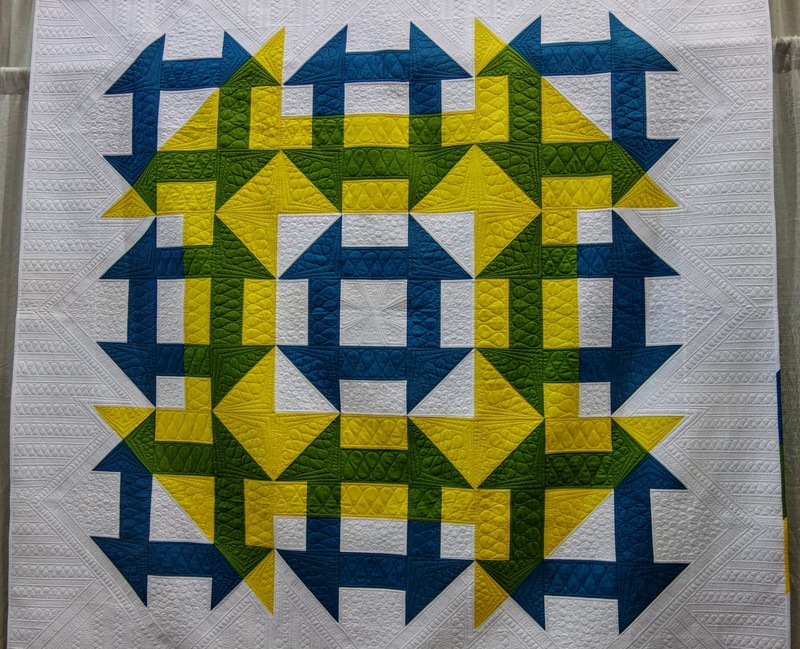 The first half is a quilting workshop with Craftours, followed by four days with Beth and Bill. Great combo! Here’s a quick report on part one. I flew in a day early to get oriented and see a bit of San Jose. I had booked a morning walking tour with Barrio Bird so I headed from our hotel near the airport to downtown. My cab ride featured incredible traffic and a very friendly driver who had about as much English as I have Spanish. We made ourselves understood and enjoyed learning from each other. She was interested that I had no children, and I’m afraid I shocked her when I said that my religion was “nada.” She set me down at Parque Morena where our group was to meet. Our group was only three: me plus a young couple, an American lawyer and a Swiss architect, who lived in Switzerland and had been traveling throughout South and Central America for over a month. Our young, enthusiastic guide took us through all the high points. The metallic building: very modern in 1897, shipped from Belgium with each part labeled with a letter or number for easy setup, kind of the Ikea of its time. You can see the letters and numbers at the bottom of the columns here. It’s been an elementary school ever since, and despite the fears of the townspeople, the children have not baked like cookies inside the hot metal building, due to cross-ventilation and good insulation. I wish I could tell Pat about it (the architect was intrigued). We walked through several small, beautiful parks featuring, of course, house plants. They live outdoors here and get enormous. 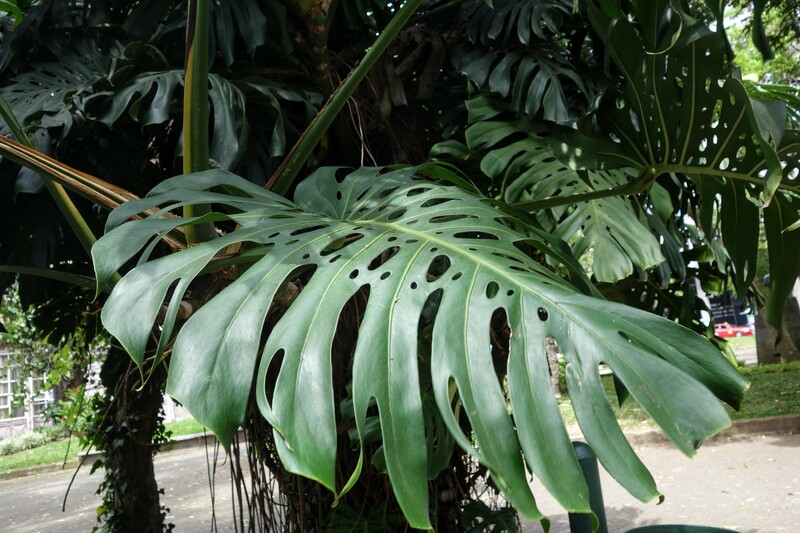 Here’s an example, the monstera deliciosa. We ended up at the liquor factory, now an arts center, most interesting to me because of the sun dial outside that was installed incorrectly. 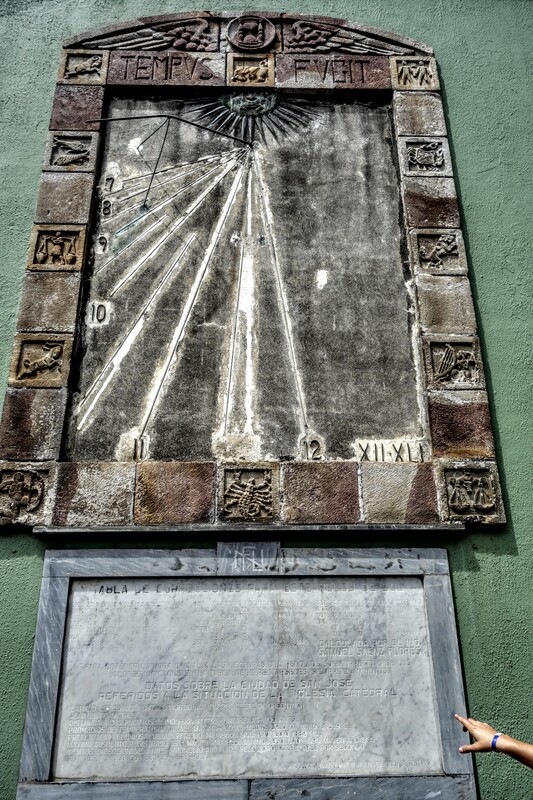 Rather than re-do it, the powers that be installed a plaque below it with an elaborate formula for calculating the correct time. 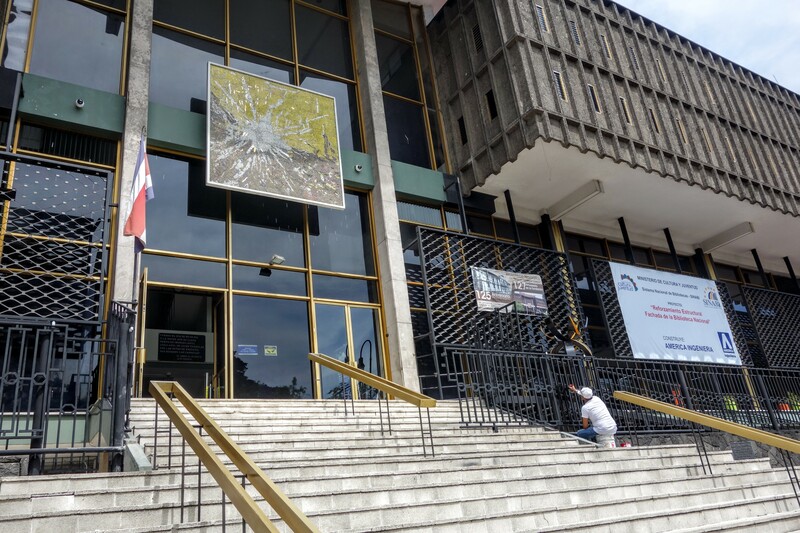 After walking by the national library, an imposing though not very welcoming building, we came to a monument to a bit of history that most Americans know little or nothing about. William Walker was a brilliant young man from Tennessee who earned a medical degree and studied law. In the 1850s he decided to invade Central America with the goal of annexing it all for the US, thus creating more slave states. Though it was not a US invasion, it was certainly sanctioned by our government. 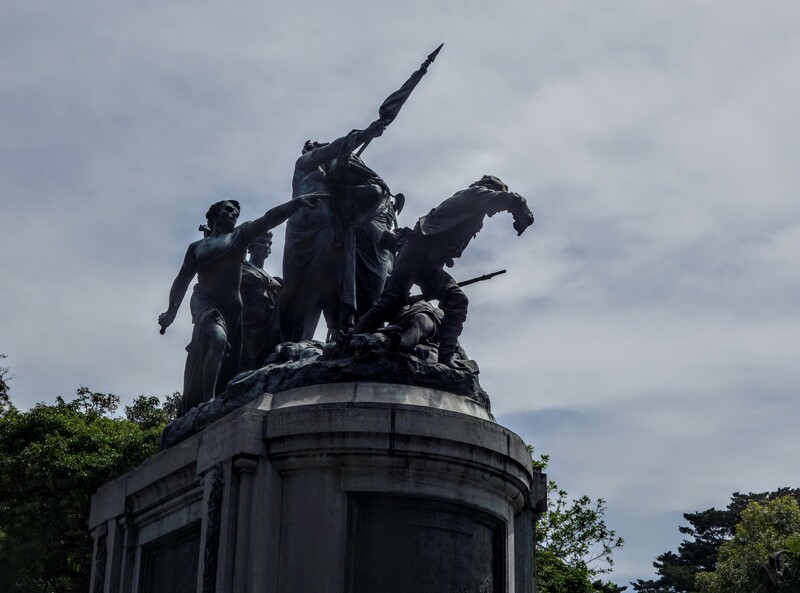 It ended badly for Walker, and the monument commemorates the five countries (actually just provinces of Spain back then) that rallied against him. The hero of the day was Juan Santamaria, after whom the airport is named. There’s clearly a good story there, which I will try to track down…someday. 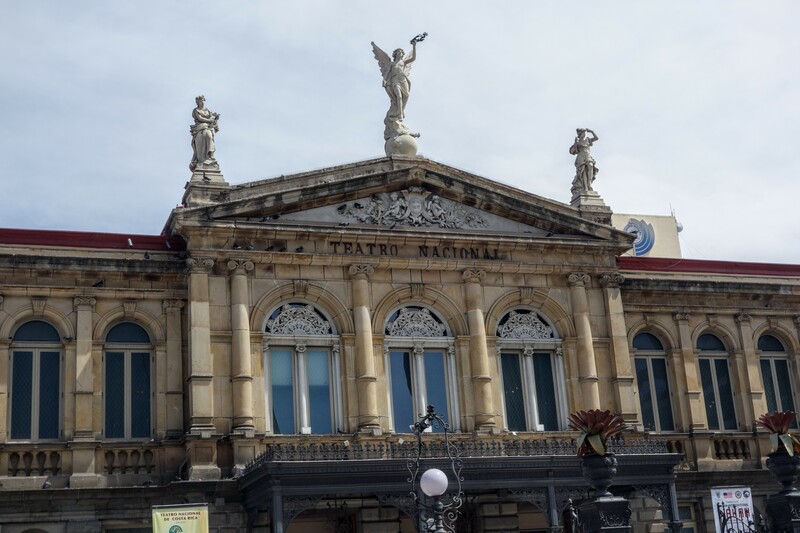 We ended up at the National Theater, an ornate building dating from 1897. 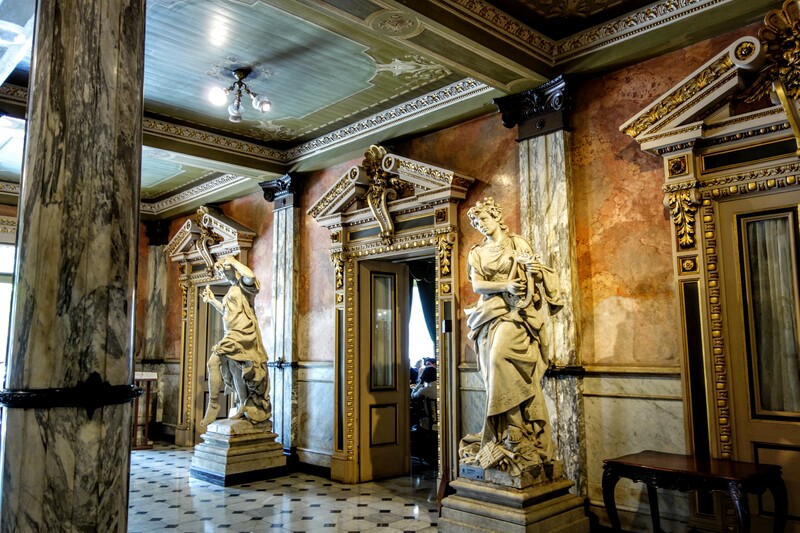 Built with coffee money, it opened with a production of Faust and features statues of Chopin and Beethoven among others. The interior is quite lavish. Between this and the metallic building, San Jose was really on the cutting edge of art and culture back in the late nineteenth century. 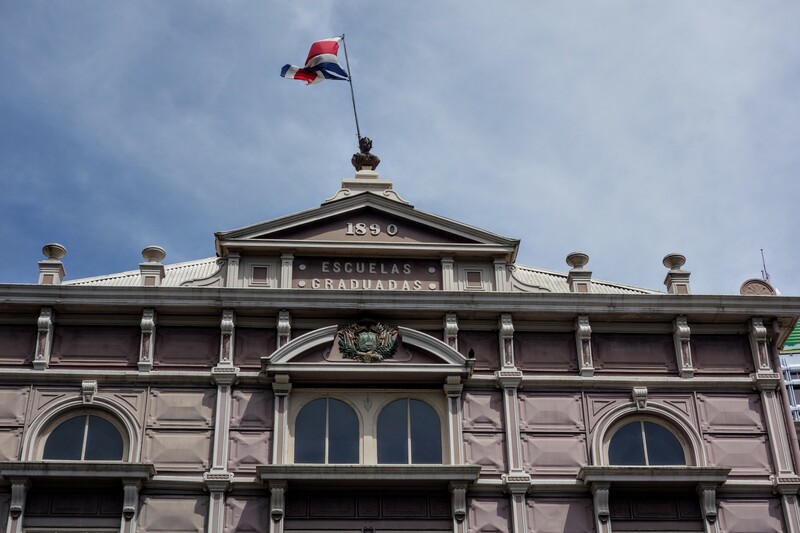 Oh, and our guide told us that San Jose was only the third city in the world – after Paris and London – to have electricity! It makes me think of those opera houses built in the jungles of South America in books by Eva Ibbotson and Ann Patchett. After catching a quick lunch at Starbucks (sorry! 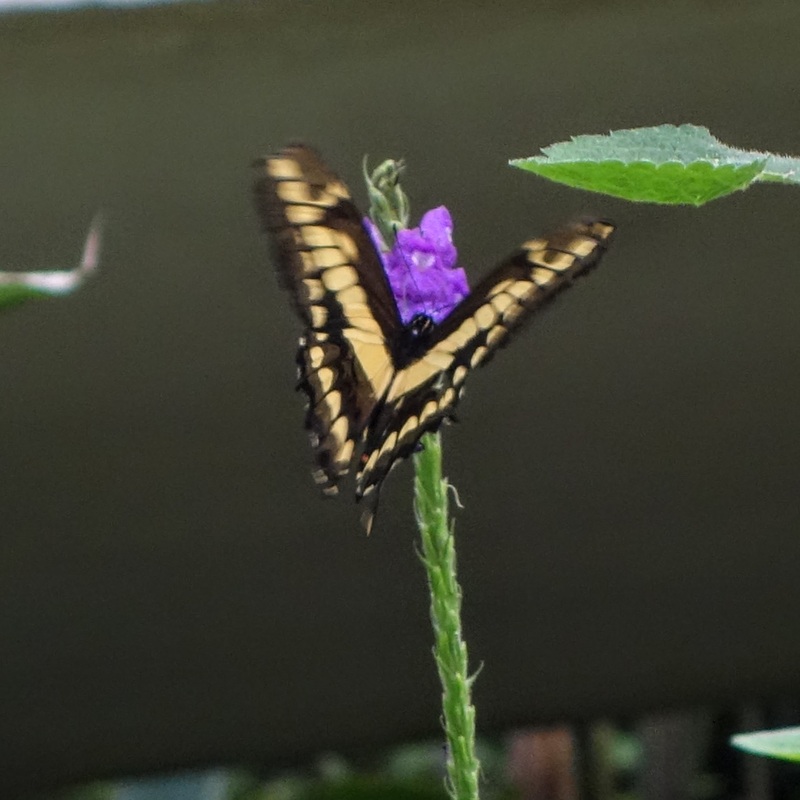 ), I walked back to the National Museum of Costa Rica which you enter through a butterfly garden. Here’s one. 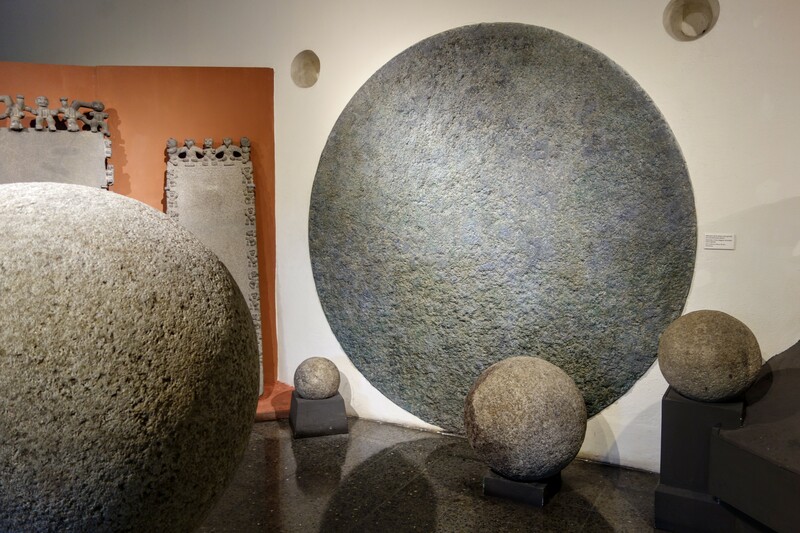 An exhibit of pre-Columbian artifacts included these remarkable stone spheres. They date from 600 but were re-discovered in the 1930s when the United Fruit company was clearing land for banana plantations. The culture that made them has long since disappeared. From here I walked down to the nearby Jade Museum for a cold drink and a rest. I met one of our instructors, Pepper Cory, and together we rode the hop-on hop-off bus through the city, seeing sights like the president’s house (just the condo he lived in when he was elected), the gorgeous mosaics outside the University of Costa Rica, and the seamy side of town where drugs and prostitution made for a depressing scene. After that, the driver agreed (I don’t really know why) to drive us 40 minutes back to our hotel, which was very generous of him. Pepper and I discovered a mutual admiration for the Bernard Cornwell books and had a lovely chat as the sun set. And so to bed to prepare for the first workshop tomorrow.